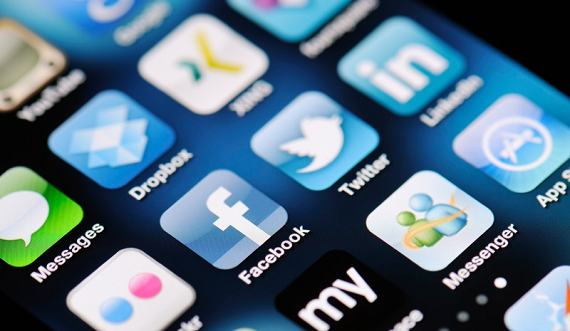 When you think about the apps you use the most, are they the ones that cost you any money? Did you either pay for them, or do you continue to pay for them now? The answer is probably not. There's a big disconnect between the games and apps we use most, and the ones that generate the most revenue, according to a new report out from App Annie on Wednesday. The company broke down the most popular games and apps, looking at which ones are downloaded the most and which ones generate the most revenue. In both cases, they were not the same ones. 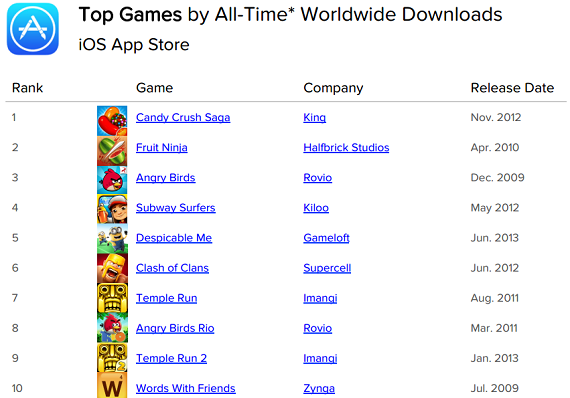 The most downloaded game of all time is Candy Crush Saga. Released on mobile in November of 2012, by November of 2013 it was downloaded an astounding 500 million times in one year. Impressively, the game has reached the #1 daily top iPhone game ranking in over 100 countries. Candy Crush absolutely dominates the number two and three apps. Fruit Ninja, which comes in at number two on the list, was released in April 2010 and had over 20 million in March 2011. Angry Birds had 50 million downloads a year after it first launched. It is the oldest game on this list; it was released all the way back in April of 2009, a time when there were far fewer people who had smartphones on which to play their games. Now look what happened when the company released Angry Birds 2 in July: the game was downloaded over 20 million times in its first week alone and has now been downloaded 50 million times already. The Angry Birds is one of two franches, along with Temple Run, to get two games in the Top 10. In each case, the original game ranks higher than its sequel. There's one very interesting statistic: did you notice the release dates on these games? Every single game on this list was released at least two years ago. The most recent game is Despicable Me, which was released in June 2013. Have developers hit a wall when it comes to games that can penetrate the market? It certainly seems like it. The thing is, though, that popularity does not equal making a lot of money. 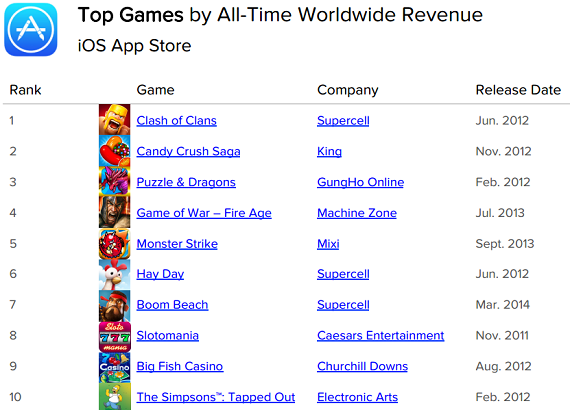 In fact, only two of the games that appear on the top 10 most downloaded also make it onto the list of highest revenue: Clash of Clans and Candy Crush Saga. They are, of course, number one and two, respectively. If anyone wants lessons on how to monetize, they should look at Supercell. The studio holds three of the top spots with Clash of Clans, Hay Day and Boom Beach. The most amazing part: those games make up Supercell’s entire active portfolio. Japan should also be used as a model, as it has two games on this list: Puzzle & Dragons and Monster Strike. One studio you shouldn't model yourself after is Rovio. Despite having two of the top downloaded games ever, the studio is nowhere to be found on the list of top monetized apps. The company recently announced that it is slimming down, cutting 260 jobs out of 670 total employees, a total of nearly 39% of its workforce. I'd also like to give a shout out to my favorite game, The Simpsons: Tapped Out, a.k.a.the only game I have ever actually given money to. Glad to see I helped them make the list! 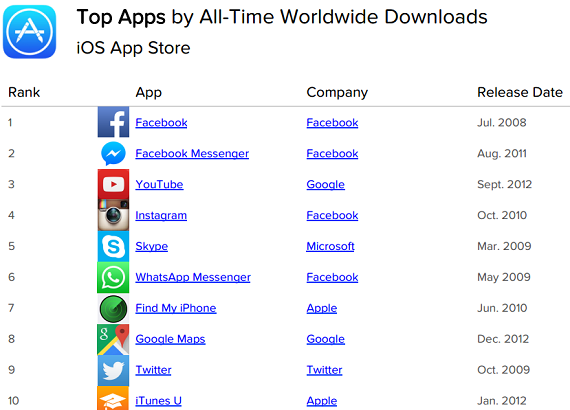 When it comes to other apps, besides games, Facebook absolutely dominates. Like, it just kills everyone else, with four of the top 10, including the top two with the flagship Facebook app and Facebook Messenger. That shouldn't be too surprising. As of its last quarterly earnings report, Facebook's monthly active users were 1.49 billion on average, while mobile MAUs were 1.31 billion on average, an increase of 23%. And, since it was decoupled last year, Messenger has racked up a total of 700 million users. To put it mildly, there's a lot of people using Facebook on mobile. Google and Apple each had two apps on the list; Twitter and Skype are the only apps from companies other than Google, Apple or Facebook. Again, there is an age problem here: the most recently released app on this list is Google Maps, which came out in December of 2012. Why have developers lost the ability to create popular apps? 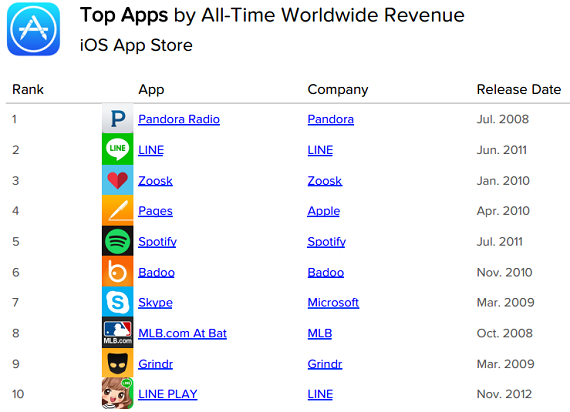 When it comes to which of these apps make money, the difference is even more stark than it was with games: only one app, Skype, appears on both the download and revenue alltime rankings. Not one other of those apps, none of the ones from Facebook, Google or Apple, make money. Rather than the social and messenger apps that dominated the first list, the majority of the top-grossing apps of all time are entertainment, meaning music and sports, or they are dating apps, such as Zoosk and Grindr. Most of these apps use a freemium business model, which is how most games operate as well. That means that the app is free for anyone to use, but they have to pay more for certain features. Only one app makes all of its money from paid downloads, charging a hefty $9.99: Apple's word processor Pages. So what's the lesson here? I guess that popularity doesn't always equal huge returns. Just ask Rovio.